I was in Arizona this past weekend celebrating my birthday with my cousin (who has the same birthday!) and we got our first taste of Spring weather! I even landed back in Los Angeles on Sunday to clear blue skies and a warm breeze. It was heavenly! It’s about this time of year I transition from heartier Winter meals to lighter Spring and Summer dishes, and this easy salmon recipe is one of my favorites! The salmon fillets are simply seasoned with avocado oil, salt and pepper before roasting in the oven. I like to use a clay baker, but a sheet pan lined with aluminum foil would work as well! You just want to make sure your salmon fillets won’t stick to your pan. 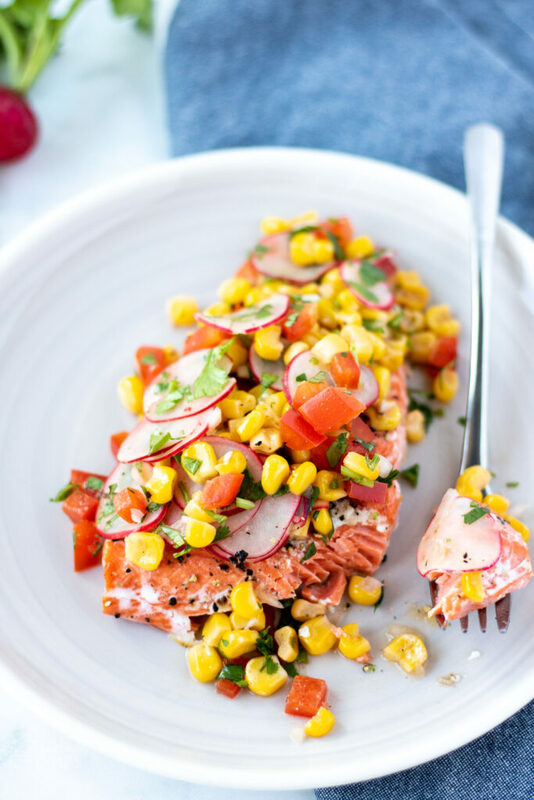 The roasted salmon is then topped with a simple, but delicious corn and radish salad. The corn is first sautéed and cooled, before adding to the sliced radishes, a bit of red bell pepper, cilantro, and green onion. Add a squeeze of lime juice for a little zing, and it is ready to be served on top of the salmon! Radishes are at their peak in Spring, and these little red roots add the perfect crunch and balance out the sweetness from the corn beautifully. Make sure when you are picking your radishes that you buy them with the greens still attached. The tops should be bright green and not wilted or brown. This easy salmon recipe is sure to be a new favorite this Spring! 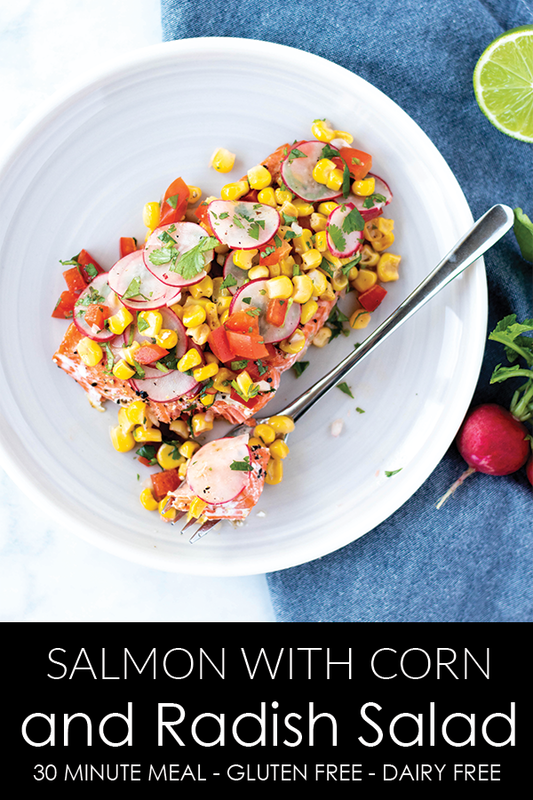 A light, fresh, and easy salmon recipe with a tasty corn and radish relish on top. A perfect weeknight recipe that is ready in under 30 minutes. Start the corn first. Heat a 10-inch skillet over medium-high heat. Add a drizzle of oil, and the corn. Stir frequently, until corn is golden and has started to char, approximately 8-10 minutes. Remove from heat, and transfer to a large bowl to cool. Rinse and pat dry salmon fillets. Check for and remove any remaining bones. Rub both sides in avocado oil and arrange fillets skin-side down on baking sheet. I use a clay baker, but if using a metal pan, I advise lining with foil for easy clean up! Sprinkle fillets with salt and pepper, and bake for 12-14 minutes, or until cooked through. Salmon will feel firm, and flake easily when done. 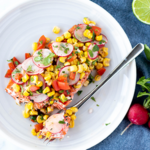 While the salmon is cooking, prepare the relish – in the bowl with the corn, add bell pepper, scallions, radishes, cilantro, lime juice, cumin, and salt and pepper. Toss, and adjust flavors as needed to taste. Remove skin from salmon fillets, before serving. It should scrape off easily with a spatula. To serve, arrange fillets and top with corn and radish relish.